I thought I'd bring you some "news" from the Blogging World, before it all gets too old. Been meaning to write this post for a week. 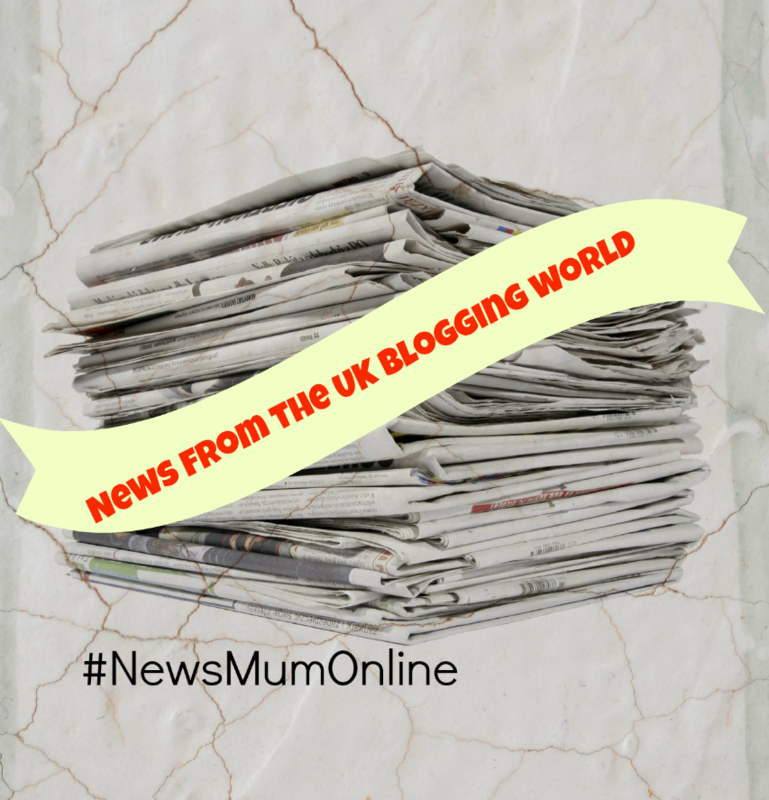 Regular readers will know about my feature #NewsMumOnline but this time the goss is from the blogging world rather than mainstream media. I haven't purchased a newspaper in ages. I was buying them for #NewsMumOnline but about 90 built up on the dining table, without me writing a post so they're all in recycling now...... eeeek! First up, Nickie a couple of weeks ago, brought our attention to the fact that Hannah Maggs' husband was asking their YouTube and Twitter followers to tweet @DJIGlobal on his behalf for a drone upgrade. His had flown away. He'd filled in the form to get a replacement but had set his sights on a much dearer one, that he could use free of charge in a collaboration that would benefit the company. DJI displayed a sense of humour throughout the whole affair, that I think brought them a lot of brand awareness. Stef could have been a real gentleman, and shown just as much charm is his tweets, but unfortunately there are two little boys in their household so he had regular rants and outbursts, like this one. 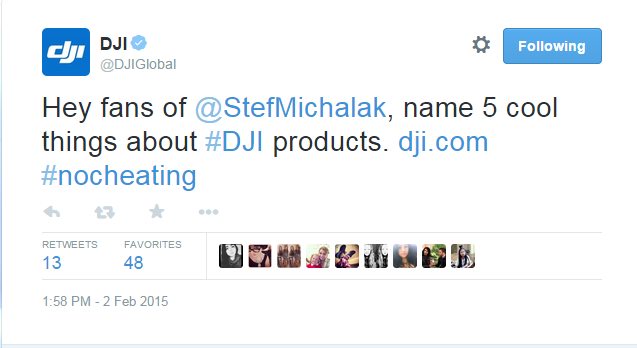 DJI toyed with Stef and his fans for a while, and enjoyed the attention on Twitter before saying "yeah but no but", and stuck with just the replacement and NOT the requested upgrade. Stef was quite terse in his replies to Nickie, calling her "literally the worst thing about You Tube", so she started this thread on Facebook, which kept a lot of us in coffee reading for a couple of days. To be fair their videos are stunningly edited (he says this takes 3 days, which is why I guess they publish Vlogs only once a week, on a Sunday), but Stef has a bit of a attitude problem with being challenged it's fair to say. He could have had a good old banter with Nickie and it'd all have been very different. Nickie vlogged about it, which considering he called her "the worst thing about You Tube" is understandable and was an over-the-top immature response from him. He's since also vlogged about it - tsssk he does so at the end so I literally had to watch the whole video, which I actually quite enjoyed - ssssh don't tell anyone. Helpful Mum blogged about it too as the "worst thing about You Tube" tweet went to her and Nickie. As with all boys, they mature with age. And as us Mums know, what little boys want is just what little boys get. No surprise then that Steph's Beta idea for a website is WANT FEED... Kind of appeals to my spiritual beliefs in "cosmic ordering" except for the fact that his prickly attitude and sense of entitlement has put me off somewhat! Look who's back!!! Thanks to our amazing viewers!!! More drama in the blogging world. Blogger Luci was let down by a party company, when her Elsa from Frozen, for her 5 year old's dream birthday party, looked a bit ridiculous and her performance was found lacking. She wrote a review to warn other parents: Aeiou Parties Rreview Awful Eexperience Now, I read the reply from the company and when reading felt extremely sorry for them it has to be said. My sadness on the damage to their reputation didn't last many hours before I read Chelsea Mamma's review of a Frozen Party and once again felt how I originally had, that the party was well below par. Chelsea Mamma's post showed me the standard that Luci should have and could have received. The great review shows what IS possible, when it is done properly. What's even sadder is the great party was cheaper than the tragic one! 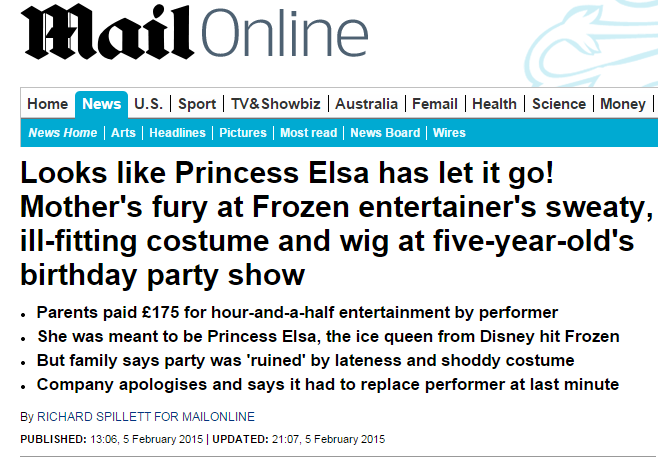 The dire Frozen Party even made the Daily Fail Mail. By now, you may have read The Daily Mail article, the original blog post review of the party, and if either of those lead to you reading the company's apology on their website, then reading Luci's reply to that will put it all back in perspective again: Parties Review owner leaves comment on post. Myleene Klass instigated some drama on Instagram, by posting emails: one and two, that she'd received from fellow parents at her daughter's school. When I read them in a vacuum I was as horrified as she herself claimed to be, and clearly so was The Boy and Me. I was so shocked I even commented on Myleene's Instagram on email one (I just saw it still there). But I later read a post by Mummy Central who made me think again - I totally did an about turn in my standpoint. I didn't realise till then that a year had elapsed between the emails and Myleene posting them. Also, I hadn't even considered the effect all of this may have on a little school girl, who needs to be protected from any adverse effects of her Mum's celebrity status. If she never gets invited to a party ever again, that'll be harsh. Also, some people on forums say that school year does all parties like that - if that is true then it puts the emails in perspective, but maybe Myleene just wanted some free publicity but at what cost?!?!??! There is tales that there was a backlash. I am going to read up on this Heathrow story that Midlife Single Mum's blog post brought to my attention. I knew nothing about it despite it being a UK story. Just finally read her post despite book marking it back on 9th February. What following the whole drone Stef thing taught me, is having to go to different platforms to read stories and threads is incredibly time consuming but how brilliant that Rachel from Midlife Single Mum has thoroughly brought me up to speed on this Heathrow couple and I didn't even need to click through to the Daily Fail as her detailed and informative post is summary enough for me. Wow she is a Miss Marple in the making when she has her teeth into a story!!! Go Rachel!!! To end on some positive news that is not of a drama llama nature, I thought I'd finish with something great. I was watching TV the other day and a Sainsbury's advert made me stop in my tracks. A UK blogger on TV, and as the main star, the only person on screen. Well done English Mum - whoop whoop. Looks like blogging and vlogging are on the brink of great things in the UK. This is cool! I miss all the blog gossip especially who is involved in what as people reluctantly (and sometimes rightly) dont tell is all the info! I'm not into you tube at all I have no idea about that drone stuff so have comment. I read the party one IT was awful and theur apology was crud, they have something to learn from that experience and Id be surprised if they suffer no damage at all especially after the newspaper. They could do a thousand great parties but because they've handled this so so wrong Id never trust them with a kids party! Not a fan of myleen (sp?) she has had some bad publicity recently and this has got her back into the talking point but she's done it in a way that could but hopefully not effect her little girl at school. Yes I read them too and was shocked because although I don't mind people asking for this theres a way to do it! But a year on!? Why?! Move over Perez Hilton - it's like you have covered all of this weeks gossip from the blogging/vlogging world. Definitely Perez Hilton #2! How do you find the time to read all this gossip? Amazing! I watched Nickie and, as I wrote to her, I've seen MUCH worse on You Tube. I thought I'd watch Stef's vlog to e fair but then I saw it was over 28 minutes long and seemed to be just shots of his cute baby playing and smiling. I'm all for supporting other people's cute babies but I'm not giving him half an hour of my life for it. Thanks for the mention - I admit I became somewhat obsessed with the story about the 'homeless' couple at Heathrow. I just couldn't believe their chutzpah to try and sell such a dodgey story. I saw that article about the frozen party crazy or what. I haven't seen the Sainsburys advert yet, but I'm quite excited about the idea of a blogger being used in it rather than a celebrity! Oooh love a bit of gossip nicely laid out so I can read it easily. I'm terrible at keeping up with whats going on, so very useful. Really not sure about Drones being allowed to fly about anywhere and everywhere though. It's nice to see a blogger on TV and that big companies are taking notice of us for advertising too! I love this feature as sometimes my head is buried in the sand and I miss what is going on. Thank you so much for including me, I really appreciate it. I am with you about Myleene - at first I was outraged by the greedy parents but leaving it a year to tweet.......thats calculating!! I love this - all the blog gossip!! I laughed when I saw the frozen party photos but then I thought if that had been my daughter's party I wouldn't have been laughing. Love your roundup!